Oh really, you thought that white chocolate has been around for ever? Well guess again. In 1930, Nestle created the first white chocolate bar in Switzerland. They called it Galak but now it's known as Milkybar in most of Europe and is promoted by a blond, glasses-wearing child who's dressed as a cowboy. Fabulous. Anyway, a year after nestle introduced their Galak bar, white chocolate was manufactured in the old U-S of A, taking off as delicious chocolate variation. 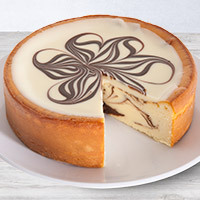 Our White Chocolate Swirl Cheesecakes may not be promoted by a mini-cowboy but that's only because it's so good, it doesn't need any promoting. 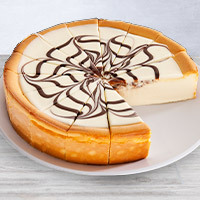 Sweet and rich, these delectable desserts sell themselves.